My wish list for corporate learning 2015. Just four, all of them L&D maturity indicators. No, we don’t stop blending. But we stopped talking about it because slowly but surely everything became more or less blended. At design time, all options are considered equally, without having to discuss technology-mediated versus no-tech solutions in a discussion that (quite artificially) precedes design. The use – or rather, the non-use of the term “blended” becomes a sign of maturity in L&D organizations. If your L&D plan document for 2015 contains many instances of the word “blended”, then your department is behind the curve. Those ahead have embraced technology and learning solution design by judicious use of the right affordances for the right learning activities and outcomes. There is no need to talk about “blended”, just as we didn’t use a special term when printed matter, whiteboards, overhead projectors, radio or video became part of the L&D toolbox – it’s all part of the toolbox. Do you still “blend” today? If so, you must hurry, there’s a lot of ground for you to cover. In the US, male workers hold on average 7 jobs in their first 10 years. In Europe, graduates hold an average of 1.6 jobs in their first three years (“Job Mobility in Europe, Japan and the US“). Still, the typical LMS of many large corporations provides a closed, non-portable experience for learners, with data owned by the company and not by the individual. And while we have witnessed the consumerization of IT reshape how organizations think about technology use, many have not moved an inch when it comes to learning data storage and portability. Fortunately, the LRS and Tin Can specifications make it possible for learning systems to talk to each other, and do so in a richer vocabulary than what was available under SCORM. 2015 marks that inflection point where portability and Tin Can become one of the high priority items when considering any LMS upgrade or replacement. We have empowered employees in many ways, but not in how they choose and document their learning. Let’s start to make that happen in 2015. It’s been a great year for designers and trainers who are not bound by strict rules on the type of technology they can use in the workplace. It has been, however, a year of experimentation more than fully developed applications. The app range supporting learning and training activities is vast, but fragmented, and in some cases not far from basic proof-of-concept builds. My wish for 2015 is that it will mark the year where new patterns for L&D app development will start to emerge, with more focus on affordances that support specific learning activities and goals, on good integration paths, and less on technology itself. Only the disciplined developers who offer cross-platform solutions coupled with solid support will see their projects move on to 2016 with a substantial customer base. No more MOOC-derived acronyms please. Let’s leave MOOCs where they belong, a connectivist, aggregated, open learning space. Sorry, Coursera and Udemy, you are not it (last time I checked you don’t look like this), and no acronym rehash will ever make you closer to a true MOOC. The original design is an inspiration, a building block – let’s thank Downes, Siemens, Cormier et al. for their contribution, and let’s use that building block to create new pieces that fit the corporate and commercial contexts. But please let’s stop pretending that a paid-for, canned piece of self-paced individual elearning has anything to do with MOOCs. In 2015, L&D teams stop feeling the urgency to do “something about MOOCs”. First, because they have truly understood what they are, how they work and what aspects can help learning and development in organizations. Second, because they understand that corporate learning and the MOOC concept are partly incompatible, and there is no point in mixing water with oil, or calling oil by another name so it doesn’t look like you are trying to mix the unmixable. Social learning and personal learning paths you say? Now that sounds like being on the right track. Add an LRS to that please. 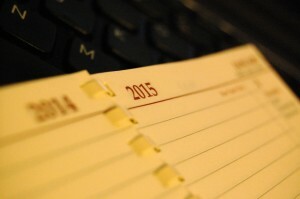 Are these part of your L&D wishes for 2015? Do you disagree with some of my “predictions”? What would you add? What would you change?